Due to popular demand Paul's Fishing Kites has the best snapper fishing hooks found from this extensive fish hook research project available online. This research gives a comparison of various fish hooks and fish hooks fitted with wire appendages and measures the catch of fish by hook type. The paper also measures and compares each hook type and the catch of small and gut hooked snapper (Pagrus auratus) taken by recreational fishers in the Hauraki Gulf of New Zealand. Barnes, P.D.L, Walshe K.A.R, Manly B. F. J. This project assesses the selectivity characteristics and gut hooking rates of a variety of commonly used recreational fish hooks in the snapper (Pagrus auratus) fisheries. The primary objective is to assess the wastage of undersized fish in the recreational fishery through fishing related mortality, and to trial fish hook modifications to determine if this wastage can be reduced. While previous hook mortality projects (Willis 1999, and Barnes 1997) have been focused on longline style hooks used by commercial fishers, this project assesses at selectivity by size class, estimates the likelihood of gut hooking on popular recreational hook types and measures the effects when anti-gut hooking/selective appendages are fitted to the hooks. In New Zealand snapper are widely distributed throughout coastal waters around the North Island and top of the South Island down to depths of around 120 metres. The greatest concentrations of snapper are found around the top half of the North Island where they are the most sought after inshore finfish species by both commercial and non-commercial fishers. Snapper frequently school in aggregations of mixed size classes and this can lead to the capture of high numbers of undersized fish even in deeper areas well offshore. When hooks are used to catch snapper a percentage of the catch is deeply internally hooked with the hook point penetrating into sensitive gill structures or further down into the throat area. In this report any fish deeply internally hooked are classified as GUT HOOKED while fish not internally hooked are classed as LIP HOOKED. Around 70% of the total snapper catch in the management area SNA1 and 25% of the snapper catch in SNA8, are taken using hooks, the balance is caught by trawl, seine and gill nets. Previous research by the Ministry of Fisheries has determined that around 95% of lip hooked undersized snapper survive when released while around 95% of gut hooked snapper die soon after release. The previous research also found that gut hooking was the major causative factor in the post release mortality of undersized snapper in the commercial and non-commercial hook and line fisheries. The minimum legal size limits which are set for each sector of the fishery will have an impact on the number of gut hooked fish returned to the sea, at higher size limits more gut hooked fish are returned to the sea as a larger portion of the catch becomes undersized. The current commercial size limit for snapper is 25cm, while for non-commercial fishers the size limit is set higher at 27cm. Many recreational fishing clubs are now encouraging recreational fishers to release all snapper under 30cm fork length or larger to assist in conservation of the fishery. In some popular recreational areas such as inside west coast harbours, or shallow inshore areas on the east coast, very high levels of small legal sized and undersized snapper can be present over the summer. As a significant portion of the recreational snapper catch is under the current 27cm size limit, the survival of released snapper is an important issue. This report also assesses the possible effects on the wastage or potential to increase productivity in the fishery under a variety of recreational size limit regimes to help determine if size limits could be a useful management tool in future. A number of studies have shown that fishing by lining is a size and species selective method of fishing (Lokkeborg and Bjordal, 1992). Although there is limited evidence of the precise shape of hook size selection curves, the curves are likely to be broad (Pope et al., 1975) and therefore using hook size to achieve knife edge size selectivity for a given minimum fish size may be of limited effect. Using larger hooks of a given type may be very effective at reducing the catch of undersize, but they may still catch a substantial number of undersize fish. (Ralston, 1990; Otway and Craig, 1993). An additional benefit of using the larger hook size may be a higher proportion of larger sized fish in the catch. However there is evidence showing smaller hooks were equally effective in catching the larger sizes (e.g. Erzini et al., 1996; Sousa et al., 1999). There is considerable literature on the level of post- release mortality of fish returned to the sea by recreational fishers (e.g. Muoneke and Childress, 1994; Chopin and Arimoto, 1995). The Ministry of Fisheries, (1997) has suggested that the use of modified hooks could decrease the catch of undersized snapper and the rate of gut-hooking with little reduction in overall catch rate of legal-sized fish, and hence require little increase in fishing effort to achieve the TACC. In the New Zealand commercial longline snapper fishery discard mortality is highly dependent on the location at which the hook is embedded (McKenzie, 1999). McKenzie found approximately 20 percent of all snapper observed from commercial longlines had swallowed the hook ("gut hooked"). Fish that swallow the hook were usually moribund or dead when brought on board, and discards very likely to die (more than 98%) as a result of damage to the gills or gut. In contrast less than two percent of fish hooked around the mouth (lip hooked) were observed dead on retrieval to the surface. In a New Zealand study of the effect of modified hooks on the incidental mortality of commercial caught snapper was undertaken by Willis and Millar (2001). They assessed snapper catches from standard Tainawa 16R longline hooks simultaneously fished for snapper (Pagrus auratus) with the same hook pattern modified by the addition of 20-mm and 40-mm wire appendages. Gut-hooking rates were markedly lower on modified hooks relative to normal hooks. Overall catch rates were significantly lower on modified hooks, however most of the loss of catch comprised undersized fish and "deads" (unsuitable for export). There was no significant reduction in the weight of export-quality snapper landed using modified hooks. Modified hooks reduced both the catch rate and gut-hooking rate of undersized snapper. Ferrell and Sumpton (1998) report on the potential for minimum fish size increases in improving yields in the snapper (Pagrus auratus) fisheries of Queensland and New South Wales. Juvenile mortality due to poor handling of fish in the recreational fishery is identified as a likely important influence on the yield. Determine the incidence of gut hooking and the selectivity characteristics of a variety of the most popular recreational hook types and sizes. Test wire appendages fitted to the hooks to determine if selectivity can be shifted away from small fish. Test wire appendages fitted to the hooks to determine if gut hooking rates can be reduced. Assess likely outcomes of a range of size limit regimes by hook type to determine if improvements in yield from the fishery could be achieved through either a reduction in wastage, an alternate size limit regime, or both. After interviewing several tackle retailers and hook importers it was found that the vast majority of non-commercial fishers used either Oshaugnessy or Octopus type hooks or circle hook types. 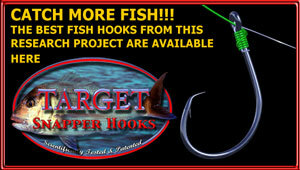 For these hooks, 4/0 and 5/0 were the most popular sizes by far for catching snapper. Gut hooking on commercial longline hooks (16r Tainawa hook) has been extensively researched by Willis and Millar (2001). This project uses 16r Tainawa longline hooks as the control treatment to allow for a direct comparison between gut hooking rates observed by Willis and Millar and those encountered in this experiment. This is important as feeding behaviour of snapper and the likelihood of gut hooking in the hook and line fisheries are both highly variable, even on a daily basis. 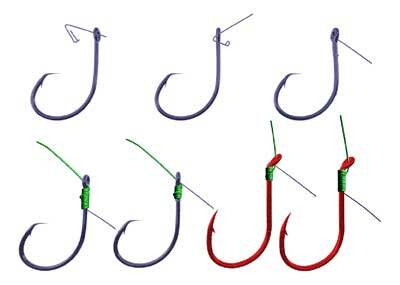 The following hooks were selected for the trials. Far Left: Two types of J type hooks were trialled, straight eye (O'Shaugnessy) and kinked back eye (Red Octopus-style). Both J types had an offset point. Center Left: The 16r Tainawa commercial longline hook has a straight eye and no offset. The hook modifications tested entailed the fitting of wire appendages to the back of the hook to deter fish from swallowing the hook. The modifications tested are shown in below in Figure 2. The anti gut hooking wire appendages used in this trial fit over, and clip onto, the shank of the hook. The appendages are held securely in place by a snell knot. More information on snelling a fish hook and tying traces so the all are the same length. Shank mounted appendage H type circle hook Eye mounted appendage H type circle hook Eye mounted appendage J type hook Shank Mounted appendage J type hook. The effects of 20mm and 40mm appendage lengths fitted to the eye and shank of the hooks are compared to hooks with no wire appendages for both J and H type hooks. The shank-mounted appendages prevent the hook being taken as far inside the fishes' mouth. A maximum of 468 hooks were run at any given set. Size 4/0 and 5/0 hooks and appendage lengths of 20mm and 40mm were trialled separately (on different days). Thus catch rates between treatments are not directly comparable. However a comparison of the catch rates and gut hooking frequency between the Tainawa Control (which were used in every set) and all other treatments is possible. To remove any angler bias in the experiment, a pre-stoppered longline system was employed. The system used clip on traces (ganglions), which are 550mm long. The traces ran between stoppers placed at two metre intervals on the mainline. The traces, fitted with various hook types, were stored on eight commercial longline trace boards, which held 58 traces each. Note * Two Control treatments of Tainawa hooks were included in the earlier part of the experiment only (the first 14 sets). After 13/3/00 one Tainawa Control treatment was replaced with an appendaged Tainawa hook. For graphing purposes only, the Tainawa catch has been double entered after 13/3/00. This effectively gave two Tainawa treatments on all sets and allowed all the Tainawa treatments to be divided by 2 to be comparable with all single treatments for graphing purposes only. All H type are circle hooks with a straight eye. The J types were half O'Shaughnessy and half Octopus-Style. Two local fishing sites were used for the trials - see Figure 3. The main fishing area (26 sets) was on the western side of the Hauraki Gulf, the area encompasses most of the popular recreational fishing spots in the western Hauraki Gulf. The area is an oval bounded by Flat Rock at Kawau Island in the north to 5 nautical miles south of Tiri Channel and is around eight nautical miles wide. Five additional sets were run in clearer and deeper waters within 3 nautical miles of the western side of Little Barrier. All the lines could be set in the same depths or over the same banks. Fish sign, if any, was relatively consistent over the 2km setting area. Inner Hauraki Gulf sets were deployed at dawn if this allowed for at least 1.5 hours of tide run during the set. Otherwise the gear was set as near dawn as possible after sunrise to allow for 1.5 hours of tide run. Little Barrier sets were deployed during the day with the tide running. The setting and hauling order of the treatments was rotated daily. One Little Barrier set has been discounted as one treatment of Tainawa hooks was inadvertently set on foul ground while the others were set over sand. All hooks were baited with squid baits. The standard pre-stoppered longline system used may have over-estimate the gut hooking rates among recreational fishers who use low stretch lines (spectra or dacron) and actively strike at the fish very early in the fishes take of the bait. The results from this trial would also be likely to underestimate the catch of undersized snapper for the above fishers. The results should give realistic gut hooking estimates for recreational fishers using the more popular methods such as lighter lines on softer rods, those who use strayline techniques, those who fish with the rod in the rod holder or obviously, recreational fishers who use 25 hook boat longlines or kite or kontiki fishing methods deployed from the shore. The selectivity trials are presented in two sections - the results for non-appendaged hooks and the results for appendaged hooks. Note: All graphs in this report are presented as size classes that match current size limits and/or fishing practices of both commercial and recreational fishers. Snapper under 25cm are undersized for all fishers. The observed catch by hook type varied considerably between the three non-appendaged hook types. The non- appendaged H circle hooks caught more fish than the non-appendaged J hooks and Tainawa hooks for all size ranges of snapper. Figure 4 shows the overall catch by hook type, non-appendaged J and H type (4/0 and 5/0 hook sizes combined) and the Tainawa control hooks. The observed catch by hook size also varied considerably between the three non-appendaged hook types. The non-appendaged 4/0 H circle hooks caught more snapper in all size ranges than the non-appendaged 4/0 J and Tainawa hooks. 4/0 J hooks and Tainawa hooks caught similar numbers of snapper for sizes less than 30cm. For snapper greater than 30cm the Tainawa hooks caught more fish than the J hook. Figure 5 Overall catch for 4/0 hooks without appendages and Tainawa hooks. The non-appendaged 5/0 H type hooks caught similar numbers of snapper between 25 and 29cm, more in the 15 to 24cm and less in the 30cm plus than the Tainawa control hooks. The non-appendaged 5/0 J type hooks caught similar numbers of snapper between 15 and 26cm and considerably less over 27cm length than the Tainawa control hooks. Each of the figures comprise 6 graphs paired horizontally so the selectivity effects of the appendages can be directly compared by hook size, appendage length and appendage attachment position. Snapper size selectivity - 4/0 hook sizes compared with 5/0 hook sizes. 20mm and 40mm appendages are combined to give the overall selectivity effect of appendage site. The 16r Tainawa control pair is useful for comparing observed differences in catch profiles between the two data sets. Snapper size selectivity - 5/0 hook size comparison of 40 mm and 20 mm appendages. Figure 8 compares selectivity of 5/0 hooks with 40mm appendages and 5/0 hooks with 20mm appendages. The Control Tainawa hooks are useful for comparing actual differences in catch profiles between the two data sets. The top two graphs show the non-appendaged hooks. Compare left hand graphs (40mm appendage trial) with right hand graphs (20mm appendage trial). Snapper size selectivity - 4/0 hook size comparison of 40 mm and 20 mm appendages. Figure 9 compares the observed selectivity of 4/0 hooks with 40mm appendages to 4/0 hooks with 20mm appendages. The top set shows catches on non-appendaged hooks and is useful for comparing observed differences in catch profiles between the two data sets. Compare left hand graphs (40mm appendage trial) with right hand graphs (20mm appendage trial). The incidence of gut hooking is shown in Figures 10 and 11, the accompanying table gives the numbers of gut and lip hooked snapper. Gut hooking varied considerably between non-appendaged hook types and the Tainawa control hooks. At first glance it appears that the H type hooks with no appendage have the least incidence of gut hooking, however the non-appendaged H type with no appendages caught around twice as many small fish (sub 27cm) as the non-appendaged J type, or Tainawa control. The apparent benefits of the proportionally lower gut-hooking rate on non-appendaged H type hooks are all but eroded by this higher catch of undersized snapper (see earlier selectivity graphs). Gut hooking rates on non-appendaged hooks were highly variable on a daily basis and this appears to have little to do with competitive feeding behaviour or seasonal effects. On some very poor sets that returned fewer fish, gut hooking rates were sometimes very high. Conversely on some of the sets which returned the best catches, where competitive feeding behaviour would seem to be more likely, gut hooking rates were minimal. Further research or interviews with experienced commercial fishers may lead to a greater understanding of the cause of variability in the incidence of gut hooking. Gut hooking rates on the Tainawa controls during these trials were the highest recorded so far. This could possibly be due to a large recruitment of small fish into the areas fished increasing competitive feeding behaviour from previous years. Smaller fish appeared to be very abundant during these trials. Squid baits were used exclusively in these trials, pilchard or mackerel baits have a slightly lower incidence of gut hooking (Willis 1999). Contrary to popular belief the H type hooks (a circle pattern) did have a relatively high observed incidence of gut hooking and gut hooked a similar number of snapper to the J type hooks for the same effort. The Tainawa 16R, the choice of the overwhelming majority of commercial fishers, had the highest incidence of gut hooking particularly on small snapper. Although the Tainawa hooks caught the fewest numbers of small fish they still gut hooked more small fish than either the J or H type hooks for the same amount of effort. The high numbers of gut hooked fish over 27cm taken on the Tainawa also reduces the quality of the commercial catch. The following graphs compare gut hooking rates by hook size and type and between treatments on the same hook sizes and types (Figure 12 - 14). The 16r Tainawa control pair is useful for comparing variability in gut hooking rates encountered during the trials. Figure 12 compares gut hooking rates observed on 4/0 non-appendaged hooks (left hand graphs) with 5/0 non-appendaged hooks (right hand graphs) and 16r Tainawa control. Figure 13 compares gut hooking rates observed on 5/0 non-appendaged hooks during the 40mm appendage trial (left hand graphs) and 5/0 non-appendaged hooks during the 20mm appendage trial (right hand graphs). As both sets of data were gathered on different days the 16r Tainawa controls pair (bottom set) are useful for comparing variability in the likelihood of gut hooking between the two trial periods. Figure 14 compares gut hooking rates observed on 4/0 non-appendaged hooks during the 40mm appendage trial (left hand graphs) and 4/0 non-appendaged hooks during the 20mm appendage trial (right hand graphs). The Tainawa 16R had a much higher incidence of gut hooking in the 5/0 portion of the trials than the 4/0 portion of the trials. The highest incidence of gut hooking occurred on the Tainawa 16R in the 5/0 40mm appendage trials. Larger hook sizes appear to slightly reduce the overall incidence of gut hooking. The 4/0 H type with no appendages gut hooked 13% of the catch while 5/0 H type with no appendages gut hooked 11%. The 4/0 J type with no appendages gut hooked 26% of the catch while 5/0 J type with no appendages gut hooked 21% of the catch. Gut hooking rates on the Tainawa 16R hooks were 25% for the 4/0 trial and 37% for the 5/0 trial so the effect of hook size may be considerably underestimated by these figures which may indicate that the likelihood of gut hooking was much greater in the 5/0 portion of the trials. The data does show a difference in the likelihood of gut hooking by standard hook type. The standard H type hooks landed the lowest proportion of gut hooked snapper, Tainawa hooks the most and the J types gut hooked around the average of the other two hook types. Tainawa hooks appear to gut hook a far greater proportion of undersized snapper than both of the other two hook types. The following graph set compares gut hooking rates of snapper taken on control hooks with gut hooking rates of snapper taken on hooks fitted with wire appendages. 20mm and 40mm appendages are combined to give the overall selectivity effect of appendage site. Compare left hand graphs (all H type hooks) with right hand graphs (all J type hooks). Table 2 shows the percentage of gut hooking by hook type. All appendage configurations reduced the incidence of gut hooking of snapper under 30cm to zero on both J type and H type hooks. The overall reduction in gut hooking in all snapper size classes taken on both J and H hook types fitted with appendages is in excess of 95%. H type hooks fitted with appendages had the best overall anti-gut hooking performance with both eye and shank mounted appendages reducing the incidence of gut hooking from around 12% to 0.2% of the total catch. The J type hooks with shank-mounted appendages also performed well with gut hooking being reduced from 21% to around 2% of the total catch. Note that the standard H type hooks and the standard J type hooks gut hooked a similar number of snapper for the same amount of effort. All appendaged hooks trialled reduced gut hooking to an insignificant level. Any appendage configuration trialled could be used to alleviate wastage caused through gut hooking of undersized snapper. The selectivity characteristics of each hook type appears to vary according to appendage length and attachment position, but this was not found to be significant in this trial. This could be due to the wire thickness of the hook as previous research on appendaged Tainawa hooks (made from thicker gauge wire) did find a significant selectivity shift away from small fish on Tainawa hooks fitted with appendages. Appendaged Tainawa hooks caught fewer undersized snapper and more large snapper than non-appendaged Tainawa hooks. (Willis and Millar) Tables 3,4 and 5 project the number of fish killed per tonne of harvest by hook type from the respective catches observed in this trial. The standard hooks represent the mortality on the unmodified hooks currently used in the fishery. Two size limit scenarios are compared, 27cm and 30cm. In the tables 95% of lip hooked undersized snapper are assumed to survive while 95% of gut hooked undersized snapper are assumed to die. The tables assume all legal sized fish are landed, while all undersized fish are released. Number of Fish Killed Per Tonne of Harvest. On average the outcome of increasing the size limit with the hooks currently in use by recreational fishers could be to increase mortality per tonne of landed catch. Reduce by around 370 snapper per tonne on the H type hooks if fitted with 40mm eye mounted appendages. Reduce by around 700 snapper per tonne on the J type hooks if fitted with 40mm eye mounted appendages. A further reduction in snapper mortality will occur if fishing effort remains relatively constant and the recreational size limit is increased from 27cm to 30cm. The weight of legal sized snapper between 27cm and 29cm caught in this project averages around 38% on H type and J type hooks. Even allowing for a moderate increase in fisher efficiency due to the reduction in the time consuming de-hooking of gut hooked fish a considerable reduction in fishing related mortality will be likely. Previous Ministry of Fisheries research has determined that harvesting snapper at a length around 30 to 35cm allows the maximum yield per recruit to be achieved. A maximum yield per recruit harvest strategy for the recreational sector would further improve the productivity of the snapper fisheries but would be difficult if not impossible to achieve with the fish hooks currently used. The wastage caused through the return of newly undersized gut hooked fish expected at higher minimum legal size limits could erode most of the benefits unless selective and/or anti-gut hooking hooks were used. A maximum yield per recruit harvest strategy at a higher minimum legal size for the commercial snapper longline fleet is also severely limited by the Tainawa longline hooks currently used because of their tendency to gut hook small snapper. Improvements in yield per recruit by increasing the minimum fish size (MFS) have been reported for the New South Wales and Queensland snapper (Pagrus auratus) fishery by Ferrell and Sumpton (1998). Their modeling suggested there was only a small likelihood of long-term yield reductions for increases of minimum legal size up to 30 percent greater than the current MFS. Yield increases of more than 50% were predicted for increases in the MFS from 25cm to 40cm. However, a significant undersized component was found in the recreational fishery from inshore waters. Seventy five percent of snapper caught and landed in inshore waters were undersized while this percentage reduced to 10% for offshore recreational anglers. Compared to offshore anglers, inshore recreational anglers also reported catching and releasing a high proportion of undersized snapper. Despite the fact that increases in minimum legal size cause reductions in the numbers of fish landed there are significant gains to be made in terms of yield in weight (Figure 9. 4). It is not until the size limit is increased to over 40cm that the risk of achieving reduced yields becomes apparent as natural mortality negates gains that are made due to growth. However, increases in yield of over 50% are predicted for increases up to about 40 cm. We estimate only a 2 % probability that yields would take 4 years to return to pre change levels if MLS was increased from 25 to 36cm. An important issue relevant to the question of raising the minimum legal size relates to the discard mortality of undersized fish. We have little information on the possible mortality from the discarding of undersized snapper caught in enclosed waters, but this could be an important factor when considering raising the minimum legal size. In NSW Talbot et al. (1992) suggest long-term mortality of 10 cm snapper caught for research purposes was about 25%, and that these fish were handled with "best practice" (Talbot , pers. com). This suggests that handling mortality of fish this size from general fishing could be higher. This research project confirms that appendaged hooks can all but eliminate the wastage caused through the mortality of undersized snapper that are deeply internally hooked in the throat or gill area (gut hooked). Specific configurations of hook size, hook type, appendage attachment position and appendage length could provide fishery managers and stake holders with a viable fisheries management tool flexible enough to achieve beneficial outcomes for the productivity of the stock under most harvest strategies, particularly in recreational fisheries. This project indicates the 16r Tainawa hook currently favoured by most commercial fishers may not be the best snapper longline hook. The 4/0 H type hook without appendages consistently out fished the Tainawa pattern and also had a much lower gut hooking frequency on legal sized snapper. The explanation for the better catch rate is likely to be due to shape of the hook being quite different, it also has an offset point and it is made of a thinner gauge wire than the 16r Tainawa. The downside is that it also catches more undersized snapper, although the Tainawa has a slightly higher mortality per tonne of snapper caught (see tables 2 and 3 page 18) for a more detailed comparison of the two hook types). It is worth noting that no snapper under 30 cm were gut hooked on appendaged hooks in this project even on the shorter 20mm appendages. It may be possible to reduce the appendage length further to around 10mm or less on the 4/0 H type hooks. This could go some way to alleviating earlier commercial fisher concerns regarding baiting appendaged hooks and still reduce the incidence of gut hooking to insignificant levels. Further research would be required to confirm just how small the appendage could be while still retaining an appropriate anti-gut hooking performance. Figure 16 and the accompanying Table compares the 4/0 H type with no appendages with 16r Tainawa longline hooks. Chopin, F. S., and Arimoto, T. 1995. The condition of fish escaping from fishing gears - a review. Fisheries Research, 21: 315-327. Erzini, K., Goncualves, J. M. S., Bentes, L., Lino, P. G., and Cruz, J. 1996. Species and size selectivity in a Portuguese multispecies artisanal long-line fishery. ICES Journal of Marine Science, 53: 811-819. Lokkeborg, S., and Bjordal, Ar 1992. Species and size selectivity in longline fishing: a review. Fisheries Research, 13: 311-322. McKenzie, J. R. 1999. Mortality of small snapper (Pagrus auratus) released from the SNA1 longline fishery December 97-August 98. Draft New Zealand Fisheries Assessment Research Document, 48 p. Ministry of Fisheries, Wellington, New Zealand. Ministry of Fisheries 1997. Juvenile snapper conservation. Seafood New Zealand, 5: 10-12. Muoneke, M. I., and Childress, W. M. 1994. Hooking mortality: a review for recreational fisheries. Reviews in Fisheries Science, 2: 123-156. Otway, N. M., and Craig, J. R. 1993. Effects of hook size on the catches of undersized snapper, Pagrus auratus. Marine Ecology Progress Series, 93: 9-15. Pope, J. A., Margetts, A. R., Hamley, J. M., and Akyuz, E. F. 1975. Manual of methods for fish stock assessment, Part III. Selectivity of fishing gear. FAO Fisheries Technical Paper No. 41. 46 pp. Ralston, S. 1990. Size selection of snappers (Lutjanidae) by hook and line gear. Canadian Journal of Fisheries and Aquatic Sciences, 47: 696-700. Willis, T. J., and Millar, R. B. 2001. Modified hooks reduce incidental mortality of snapper (Pagrus auratus: Sparidae) in the New Zealand commercial longline fishery. ICES Journal of Marine Science, 58: 830-841. The table above shows the observed number of fish killed per tonne of landed catch and CPUE (catch per unit of effort in kilograms) by size at landing, hook type, hook size and appendage length. The Tainawa standard CPUE variation of between 0.12 and 0.204 give some indication of the scale of difference in catch rates between different treatments. This report describes the analysis of an experiment to compare 21 different types of hooks for catching New Zealand snapper (Pagrus auratus). The experiment involved 28 non-consecutive days of fishing, where on each day seven hooks were trialed, one of which was always the commercial 16r Tainawa hook, which was considered to be the control. Size 4/0 H type (a circle hook), with no appendage. Size 4/0 H type (a circle hook), with a 20 mm appendage on the eye. Size 4/0 H type (a circle hook), with a 20 mm appendage on the shank. Size 4/0 H type (a circle hook), with a 40 mm appendage on the eye. Size 4/0 H type (a circle hook), with a 40 mm appendage on the shank. Size 4/0 J type, (OShaugnessy and Octopus-style fish hooks), with no appendage. Size 4/0 J type, (OShaugnessy and Octopus-style fish hooks), with a 20 mm appendage on the eye. Size 4/0 J type, (OShaugnessy and Octopus-style fish hooks), with a 20 mm appendage on the shank. Size 4/0 J type, (OShaugnessy and Octopus-style fish hooks), with a 40 mm appendage on the eye. Size 4/0 J type, (OShaugnessy and Octopus-style fish hooks), with a 40 mm appendage on the shank. Size 5/0 H type (a circle hook), with no appendage. Size 5/0 H type (a circle hook), with a 20 mm appendage on the eye. Size 5/0 H type (a circle hook), with a 20 mm appendage on the shank. Size 5/0 H type (a circle hook), with a 40 mm appendage on the eye. Size 5/0 H type (a circle hook), with a 40 mm appendage on the shank. Size 5/0 J type, (OShaugnessy and Octopus-style fish hooks), with no appendage. Size 5/0 J type, (OShaugnessy and Octopus-style fish hooks), with a 20 mm appendage on the eye. Size 5/0 J type, (OShaugnessy and Octopus-style fish hooks), with a 20 mm appendage on the shank. Size 5/0 J type, (OShaugnessy and Octopus-style fish hooks), with a 40 mm appendage on the eye. 5/0-J-40-S Size 5/0 J type, (OShaugnessy and Octopus-style fish hooks), with a 40 mm appendage on the shank. Three logistic regression analyses (Manly, 1992, Section 8.8) were carried out initially to compare the results obtained with the different hooks in terms of (a) the proportions of hooks that caught a fish, (b) the proportions of gut-hooked fish, and (c) the proportions of under-sized (less than 27 mm) fish caught. These analyses indicate that the probability of a hook catching a fish varies significantly with the fishing day and the type of hook used, the probability of a fish being gut hooked varies significantly with the type of hook used but not with the fishing day, and that the probability of catching an under-sized fish varies significantly with the fishing day but not with the hook used. The first analysis considered was on the proportions of hooks catching fish for one type of hook on one day. Values for the number of hooks (NHk) and the number of fish (Fish) are shown in the Appendix. A logistic regression model was fitted to account for variation in the proportion of fish caught. First, the day of sampling (from 1 to 28) was entered into the model. This accounted for a highly significant amount of the variation (F = 3.46 with 27 and 168 df, p  0.001). Next, the type of hook (from 1 to 21) was entered. This gave a significant improvement in fit (F = 10.52 with 20 and 148 df, p  0.001). It was therefore concluded that the catch rate varied with the day of fishing and the type of hook used. The fitted model allows the 21 types of hook to be compared as if they were all used on one day. Taking the first sampling day as the one considered, Figure 1 shows the estimated probabilities of catching fish for each of the 21 types of hook, with 95% confidence limits for the true values of these probabilities. The three highest estimates are with the 4/0 H hook either without an appendage, or with a 20mm appendage. Figure 1 Estimated probabilities of hooks catching fish on sample day 1, ranked from the lowest to highest, with 95% confidence limits for the true probabilities. The abbreviations for hook types are provided in the Introduction. The second analysis considered was on the proportions of caught fish that were gut-hooked, for one type of hook on one day. Values for the number of fish (Fish) and the number gut-hooked (GtHk) are shown in the Appendix. A logistic regression model was fitted to account for variation in the proportion of gut-hooked fish. First, the day of sampling (from 1 to 28) was entered into the model. This did not account for a significant amount of the variation (F = 1.04 with 27 and 166 df, p = 0.422). Next, the type of hook (from 1 to 21) was entered. This gave a very highly significant improvement in fit (F = 34.02 with 20 and 146 df, p  0.001). At that stage the day factor was removed from the model. This gave a significant worsening of the goodness of fit (F=3.27 with 27 and 173 df, p  0.001). It was therefore concluded that the proportion of gut-hooked fish varies with the day of fishing and the type of hook used. The fitted model allows the 21 types of hook to be compared in terms of gut-hooking as if they were all used on one day. Taking the first sampling day as the one considered, Figure 2 shows the estimated probabilities of gut-hooking fish for each of the 21 types of hook, with 95% confidence limits for the true values of these probabilities. Figure 2 Estimated probabilities of gut-hooking for fishing day1, ranked in order from 10 hooks for which no gut-hooking was observed, with 95% confidence limits for the true probabilities. The abbreviations for hook types are provided in the Introduction. The third analysis was similar to the one on the proportions of gut-hooked fish. The data were the proportions of caught fish that were under-size (less than 27 mm long), for one type of hook on one day. Values for the number of fish (Fish) and the number under-sized (Under) are shown in the Appendix. A logistic regression model was fitted to account for variation in the proportion of under-sized fish. First, the day of sampling (from 1 to 28) was entered into the model. This accounted for a highly significant amount of the variation (F = 6.07 with 27 and 166 df, p  0.001). Next, the type of hook (from 1 to 21) was entered. This did not give a significant improvement in fit (F = 0.93 with 20 and 146 df, p = 0.545). It was therefore concluded that the proportion of under-sized fish varies mainly with the day of fishing, with little, if any, differences between the type of hook used. Although the differences between the hooks are not significant, the 21 types of hook have been compared in terms of estimated probabilities of catching under-sized fish on one particular day. Figure 3 Estimated probabilities of fish being under-sized, ranked in order from the smallest to largest, with 95% confidence limits. It is important to note that these estimates are not significantly different. The abbreviations for hook types are provided in the Introduction. Manly, B.F.J. (1992). The Design and Analysis of Research Studies. Cambridge University Press, Cambridge.